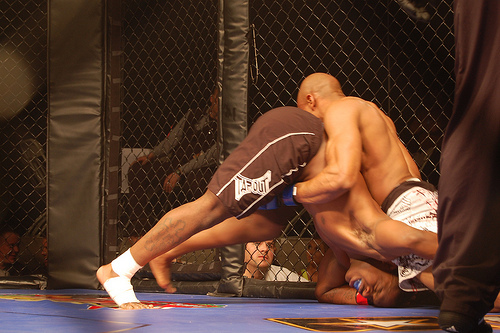 Mixed martial arts, or MMA for short, is a fighting discipline combining kickboxing moves with boxing and wrestling techniques. While many people associate MMA with a form a violent ring-based fighting, it has been turned into a non-contact form of cardiovascular exercise to help people stay fit. As MMA becomes increasingly popular, more training centres are being set up to meet this demand. So, why should you start MMA training? Here are the top five benefits. The easiest way to get into MMA is to join a fitness class. Unlike fighting classes, these courses simply help people to develop their cardiovascular endurance. An MMA fitness class is similar to ‘boxercise’ – a form of aerobics based upon boxing moves. Set to heart-pounding music, a qualified MMA instructor teaches participants how to use certain moves inspired from the ring. These kicks and punches are based on moves that actual MMA fighters would use. These classes are non-contact and so injury free. They are high paced and fun with participants dramatically improving their levels of fitness in a short period of time. If you aren’t interested in MMA for fitness, a dedicated MMA class can come with a surprising list of benefits. Professional MMA fighting is extremely popular and some fighters make their living from fights. Joining an MMA class means it’s extremely likely that the instructor will be a current or former professional fighter. Even if you live in a small town, the chances are excellent that the instructor running the MMA class will have had real fighting experience. This means that you will develop your skills faster and be assured of receiving expert tuition that sees you make swift progress in your ability to fight. If you have watched an MMA fight on TV or online, you may have assumed that only top fighters can participate. True enough, each professional fighter has their own unique training style. Some people are boxers, others are wrestlers and so on. In fact, MMA is a style of fighting all on its own. It combines boxing, wrestling and martial arts moves from a wide range of disciplines. As such, a wide range of classes are available for people at all levels and abilities at MMA training gyms. If you are a complete novice, you can join the beginner classes to hone your skills. If you already have a background in martial arts, an advanced class will cater perfectly to you and help you become a better MMA fighter. Many people who have trained in martial arts come to MMA because they want to know how to fight. Unlike boxing or Muay Thai, MMA can help you when a fight goes to the ground – as real fights often do. MMA has direct real world application for defence. When you know how to defend yourself in a real situation, your mind will be calmer and your levels of stress will be reduced. Once your begin MMA training, your ability to walk away from a fight will improve. If you are joining MMA from a martial arts or boxing background, you likely already have good levels of discipline. Novices often find that they benefit from the discipline that MMA instils. It teaches discipline of the body and mind and promotes healthy eating principles that help fighters recover after fights. MMA is an excellent physical workout and beginners will find that their levels of fitness go through the roof once they begin training. Sparring (boxing practice) and grappling (wrestling) is usually completed in five minute bouts. Surviving a five-minute fight takes amazing levels of fitness. The MMA training is designed to get fighters ready for this and to help them succeed. These five benefits of MMA fighting should help you decide whether you want to give it a shot. As this article explains, there is a whole spectrum of MMA classes out there to choose from. If you are just interested in fitness, then an MMA exercise class would be most appropriate. If you want to learn to fight, you can choose a fighting class relevant to your level of experience. Most training centers offer a wide range of classes to accommodate everyone from rank beginners to advanced fighters. Some trainers even offer MMA classes for kids and MMA classes specifically for women, so the options are truly limitless. Check out your local MMA center for more information about getting started in the world of MMA today. If you already have experience of MMA, what do you think of our list of benefits? Which benefits would you add? Let us know and leave a comment below! ← Why Is Everyone Talking About Mixed Martial Arts?